What is a Nexus Study & Why do I need one? Nexus is the connection between the seller and the state. If sufficient nexus is present, the seller is obligated to collect and remit sales and/or use tax. Prior to the recent US Supreme Court ruling in South Dakota v. Wayfair, Inc. a seller had nexus if physical presence existed in the state. However, upon the Wayfair ruling, states can establish sufficient nexus through economic means by way of the sellers gross sales or deliveries within the state. As of October 1, 2018, there are 30 states with enacted or proposed economic nexus legislation. Sellers are obligated to determine their compliance requirements, with each states nexus definition and thresholds. 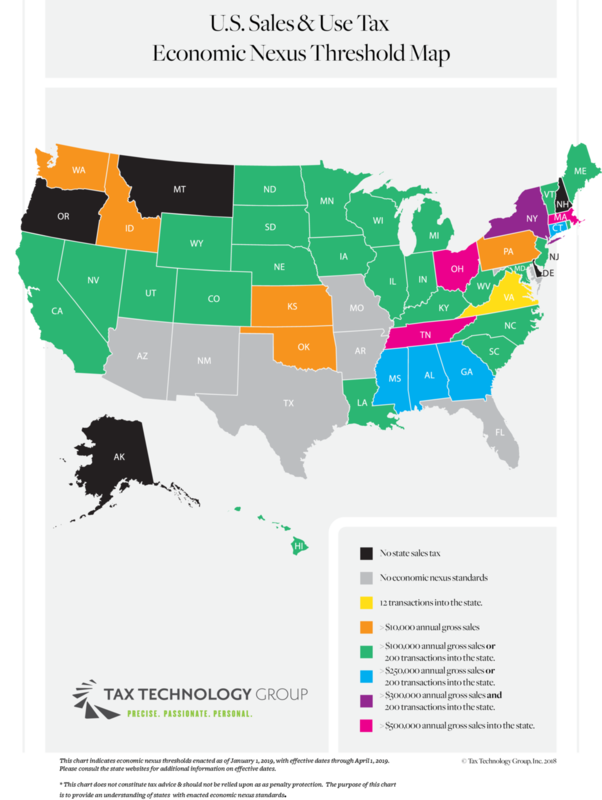 The chart below indicates the economic nexus threshold’s for each state. Click the photo to download a PDF. Updated November 30th, 2018. What will a nexus study give me? A nexus study or risk assessment can be performed by the seller or a sales and use tax professional in order to determine if the seller has met the sufficient nexus requirement and follow on obligations. The nexus study requires limited information provided by the seller; state-by-state sales and delivery information and a simple questionnaire relating to the business. With this information, the tax professional can then deliver a risk assessment indicating not only where the seller is responsible for collecting and remitting sales taxes, but also where the seller may be vulnerable to such nexus standards or other tax related interests. This information can then be used to register or participate in amnesty or voluntary disclosure agreements which drastically reduce the risk and penalties associated with non-compliance. How can I obtain a nexus study? Tax Technology Group, Inc. is offering free consultation to sellers seeking definitive nexus answers. To begin a free consultation, just provide the required information using the request free consultation button below.